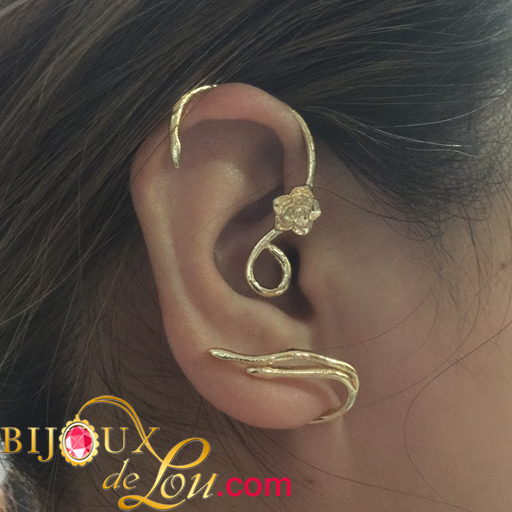 The earcuff is made of gold-plated copper. Since the base metal is copper, the earcuff is flexible. Note though that extra care need to be applied when adjusting the earcuff so it fits your ear. The photo to the left shows Belle's earcuff when worn. From the when worn photo, you can see that the portions in encircled in blue are worn in front of the ear. Whereas the portion in green is worn behind the ear. When adjusting the earcuff, gently push or squeeze the earcuffs. Do not apply too strong a force or the gold plating may flake or crack. Based on our experience adjusting the earcuffs, applying gentle pressure to the area marked in red in the photo to the left should be sufficient to adjust the earcuff to fit your ear.